After the 1967-1970 Nigerian-Biafran War (Genocide against Biafrans), Biafra veterans have been abandoned by the Nigerian government and the Nigerian Governments have failed to implement the three “R” which are Reconciliation, Reconstruction and Rehabilitation in all parts of Biafra land. But even at this, the Biafran war veterans have chosen not to give up and have taken it upon themselves to search for each other regardless of where they are domiciled to ensure that they come together as one body under IPOB led by Mazi Nnamdi Kanu to support him in the restoration project. 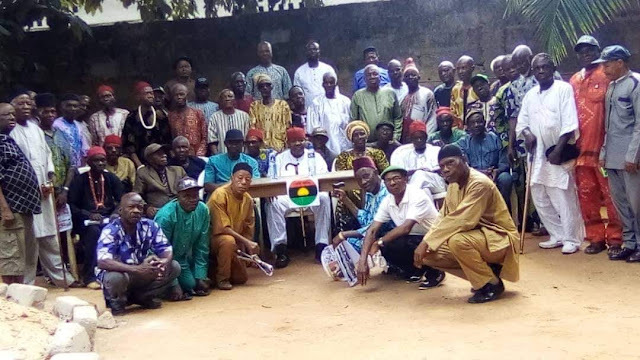 Nnewi North and South were not left out at this point, as IPOB veteran family stormed these areas to inaugurate new IPOB VETERAN families in these places in addition to the ones they had inaugurated already across Biafra land. Gen. G.C. Ukwuije (Leader of Biafra Veterans under the Leadership of Mazi Nnamdi Kanu) who came alongside his executives which include Col. Ejezie, Maj. Ogboaja (National M.P. ), Brig. Ben. Ndu, Col. Aliwa, Col. Protus, Lt. Col. Felix Obi (Okija Divisional commander), Col. Madukwe (Ekwusigo Divisional commander) Maj. Eric (Nnewi South Divisional commander), Col. Geoffrey (Nnewi North Divisional Commander ) and so many others, went further to address veterans who were present at the Inauguration. In his statement, he said “We defended our land for three years with crude arms, we ensured that our land was not taken over by our enemies, yes they said the war has ended, but I am here to tell you that the war is still on, it has not ended because if it has ended they won’t be killing our people on daily basis in the North, west and all over Nigeria, if the war has ended, they won’t be destroying our businesses in Oduduwa land, Arewa land and also frustrating our efforts in Biafra land. "They talked about the 3R but they are yet to implement it, every time they keep coming to us and defrauding us of our hard earnings even when they gave us 20pounds after the war. "Today our son Mazi Nnamdi Kanu, our leader and son has been chosen by God to continue from where we stopped in order to liberate us all, that’s why we have chosen to come together under one umbrella called IPOB VETERAN FAMILY and ensure that we support our son Mazi Nnamdi Kanu because he is fighting a just course. "As we inaugurate you people today, 1st of April, 2019, I want you to gather others too and do your best to see that the gospel of restoration gets to all Biafra war veterans in Anambra State and beyond. Meanwhile, Col. Ejezie in her own speech thanked the veterans for coming out en masse to welcome them. "This simply shows that our love for each other is still intact. I am grateful to God for keeping us up till this day, because we all saw hell but God in his infinite mercy determined that we must survive. The Nigerian Government tried frustrating our lives by taking all our properties and left only 20pounds for us, but look around, you will testify that God has been good to us. Despite all they did, we are still feeding fine than they, go to the North you will see hunger physically, in the North hunger is written all over their faces, they (The Northern and Western Politicians) loot in trillions and billions but their people end up starving to death. If you walk around the streets of the North and Biafra land you will see them carrying dirty plates begging motorists and passersby. They are just parasites to us. One funny thing is that they say that we are criminals but still don’t want us to go, they call us miscreants but still don’t want us to go and build our own sovereign state, Biafra. That’s to tell you that they have a cockroach in their cupboard, they want to Islamize us and slaughter our children. “We will not allow them, we will ruthlessly face them and protect our land as we did during the 1967-1970 civil war and this time around it won’t be funny”, she echoed. She went on to say, "Let's support our children who have risen up to restore our sovereign state. Col. Protus in his own speech said, “We will not forget the great Ikemba Nnewi (Chukwuemeka Odumegwu Ojukwu), we will always remain grateful to him and we say may his soul continue to rest in the Lord. "We will fight to finish and ensure that what he fought for comes to pass. Finally Col. Aliwa said the closing prayer and everyone departed to their various destination.